“I fell in love with those ancient trees that line the streets,” writes resident Sylvia Wilmer in a booklet made for Mooresville’s annual April walking tours. The town is just 20 minutes from Huntsville and a little over an hour from Birmingham. The Mooresville Church of Christ, circa 1854, stands beside historic homes in vibrant yellows and blues. An old shed is cloaked in vines and red Alabama dirt, lending it a quintessentially Southern patina. An angelic statue curtsies among the bricks and moss. “Trees on both sides of the street that joined their arms together to shade all those who walked below,” writes Mooresville resident Sylvia Wilmer. Step into this one-quarter-square-mile Alabama town, and leaves rustle in the branches high above while the shade of their grand arms and playful leaves dance below. White picket fences surround idyllic yards and historic homes, wisteria blossoms hang from awnings, front porch swings gently sway in the breeze and a shower of dogwood petals flutters across the road where most of the town’s 50 residents walk or ride their bikes to get around the town’s six main streets. Just 20 minutes from Huntsville and a little over an hour from Birmingham, the drive to see Mooresville — especially at Christmastime — is well worth it. During the holidays, the village’s torches are alight, casting off a warm flicker on the streets and buildings, and the homes are decorated in all their holiday splendor, ready for Mooresville’s annual Holiday Home Tour and Progressive Dinner. Known as the “Williamsburg of Alabama,” Mooresville’s earliest settlers came to the area around 1805, when the land was inhabited by Chickasaw Indians. After the Chickasaws were driven out and public land sales were held in 1818, the 64 residents of Mooresville petitioned the Alabama Legislature for and were granted an Act of Incorporation. So the town, named for an early settler, proudly boasts that it is older than the state itself, which was incorporated over a year later. At that time, the village was bustling with industry. Beautiful homes were being built for doctors and lawyers. Craftsmen and businesspeople set up shop, including a tailor shop where future President Andrew Johnson apprenticed for a time. One of the town’s few crossroads offers an idyllic view with picket fences, porches, flowers in bloom and a bench to stop and soak in the beauty of it all! 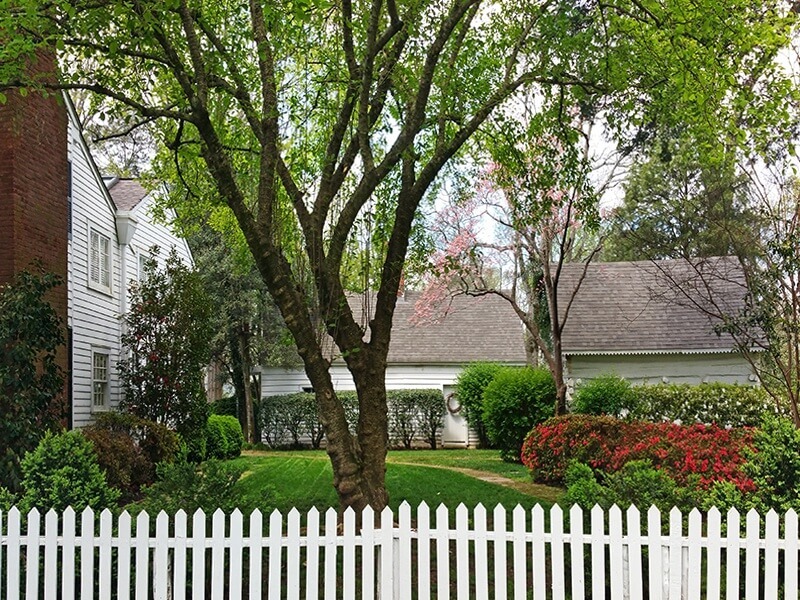 A walk through Mooresville does not disappoint, especially in the vibrant green spring when flowers are in bloom and the weather is a perfect mix of sun and cool breezes! At one time, Mooresville had a more agricultural culture, but most of the farmlands are no longer in use. This lovely pasture is now a backyard. A historic home has acquired additional structures in its sixth generation of homeowners. In this beautiful village, you can almost hear the clopping of horse hooves as they approach the Stagecoach Inn and Tavern to deliver mail. Pass by another house with a vintage screen door and covered porch, and your imagination conjures Atticus Finch pensively puffing a pipe on the porch swing. Filmmakers were even drawn to this gorgeous old town to film Disney’s Tom and Huck in 1995. This idyllic enclave stirs something in the Southern soul and awakens the universal imagination. Walking through the tiny town, one feels humbled by his place in the immense expanse of time. The 1840s post office is the oldest in continual use in Alabama. Some of the 48 post boxes have belonged to local families for several generations. For much of its history, the post office was part of a grocery, and longtime locals have treasured memories of going to the post office to get an ice cream cone. The town’s first restoration project, the historic Mooresville post office is open from 8 a.m. to 10 a.m. every day, except Sundays, and a steady stream of locals comes to gather their mail each morning. Behind the post office, this small building has housed a blacksmith, an auto repair shop and a gristmill. In 1818, an Act of Congress authorized mail delivery to Mooresville from neighboring Huntsville. In accordance with this development, a road was built as a mail route for a horse and rider. The Stagecoach Inn was built circa 1820 as the town’s first post office and a sleeping station for the mail carriers of the day. The original post office was on the right side of the building, where mail was exchanged through the small window. It is said that the same window was used for the after-hours sale of liquor. The stairway leads to the two sleeping rooms for mail carriers upstairs. Before it was Lyla’s Little House, this cottage, built in the Downing Gothic style, was constructed by a black carpenter named Zack Simmons in 1890 for himself and his wife, Mandy. “Aunt Mandy and Uncle Zack” would host a popular annual party for the whole town. Lyla Peebles restored the cottage in 2011 as her sweets and antiques shop, Lyla’s Little House. It is a popular spot for local children to get candy and ice cream. The Mooresville brick church was built in the Greek Revival period with bricks that were unusually symmetrical for handmade bricks. The steeple features a large wooden hand pointing toward heaven. The columns in front and the covered portico are covered in stucco, as was the practice of the day. Bricks still peek through in places, lending a patina and weathered charm to the stately historic building. The chapel plays host to many weddings throughout the year. It is the perfect setting for a timeless and classic wedding with a pristine and historic ambience. The Church of Christ was built in 1854 and regular services were held here until the 1990s. The Mooresville Church of Christ’s claim to fame is that future president and general James A. Garfield preached here during the Civil War in 1863. Situated on the edge of the town square, the Zeitler-Hill-McLain House began construction in 1927 and was designed in the Greek Revival style by one of Alabama’s first female architects, Carolyn Cortner Smith of Birmingham. Once the site of a log cabin after the turn of the century, this charming clapboard cottage was built in 1947. This Federal period home, built in the 1820s, is now home to the McCrarys, the sixth consecutive generation of the family to live in the home, and the eighth generation to live in Mooresville. The family added this structure, which served as an office at one point in time. In their sixth generation in Mooresville, the McCrarys gave the family home to their son and needed a new home of their own. So they commissioned architect Frank Nola of Huntsville to create a home for them. Built in 2005, the McCrary home was designed to evoke the charm of town’s historic architecture with today’s modern comforts. Shirley McCrary’s garden with its striking white gate is a vision to behold. Built in 1826 in classic Federal period brick, The Corner House was originally home to a mercantile business before being converted to a residence in 1936. Now a residence, this 1780-style saltbox house was built circa 1854 and was originally the site of the Martin-Smith Blacksmith and Cabinet Shop. Built in 1988, this home is a replica of the Crowninshield-Bentley house built in 1730 in Salem, MA. Its vibrant yellow paint job dates to 1995, when it played a role in the Disney movie, Tom and Huck. Named for the year of Mooresville‘s incorporation, 1818 Farms is home to sheep, goats, chickens, dogs and pot-bellied pigs. The farm produces goat’s milk bath tea, lavender soaking salts, bath truffles, fresh eggs from pastured chickens, wool from Babydoll sheep, heirloom vegetables and cut flowers. In May 2010, Woody Peebles turned an old equipment shed into an old-timey Dance Hall for his daughter’s wedding reception. It now serves a popular venue for events, parties and wedding receptions. Check out this wedding at the Dance Hall. Guess what? We’re heading to Charlotte, NC, this spring. Tell your friends and stay in the know on this hot Southern city. Sign up now to be among the first to know when we’re live!